I know food bloggers have a bad rap for throwing around the phrase “best ever” a little too frequently. Friends. Look at my eyes… these pancakes are the real deal. I’ve been searching for the best pancake recipe ever, and I’ve finally perfected it. Thick and fluffy, with a hint of sweetness, but not too much so you can still drown them in syrup. This is one of my favorite go-to recipes because I always have what I need to make it on hand. I love that it only requires a few simple ingredients, takes only a few minutes to make, and tastes a million times better than box mix. You know when you makes pancakes you always have that first sacrificial pancake? The one that either gets burned to a crisp or is white and raw in the middle? Not anymore. This recipe makes ten perfect fluffy pancakes every single time. There are a few tricks that can help: if you’re using a skillet, make sure you have even heat. Let your pan heat up while you make the batter; an easy way to test if your pan is ready is by flicking a tiny bit of water onto the pan. If it’s hot and ready to go the water will sizzle immediately. I received an Electric Griddle for Christmas- and I highly recommend it! I love being able to to set the temp (I use 325 degrees) and make multiple pancakes at once. It also makes perfect eggs- so smooth, no crispy edges or skirt. Griddles really do make the best pancakes (i.e. “griddle cakes”). Another tip for perfect pancakes is to use a 1/4 cup measuring cup to scoop your batter. This way you get happy, uniform, homemade pancakes. When I add the batter to the griddle I start from the center and gently pour in a circular movement to help the batter spread into a nice round circle. Keep in mind that this pancake batter will be very thick. This is what you want! There is no need to thin it out with more milk or liquid. It will be thick! It won’t “pour” like boxed mix, it will scoop. Use a measuring cup to scoop the batter onto the griddle. Don’t rush your pancakes- let that first side get gorgeously golden brown. You’ll know they’re ready when bubbles start to form and pop on the top (the uncooked side). To get a perfect flip without batter sliding around, be sure to purposefully shove your spatula (I like silicone or plastic, not metal) all the way underneath and use your wrist to turn them over. My husband taught me that. I was flipping them using my whole arm, instead of a gentle turn of the wrist, which was resulting in lopsided pancakes. If maple syrup isn’t your thing, slather these homemade pancakes with Homemade Strawberry Butter! We also like to top them with this Homemade Blueberry Syrup. My oldest loves when I add blueberries in the batter and my younger two love chocolate chips. Honestly, I usually end up eating mine plain, straight off the griddle, because they’re just that good! Note: When I add blueberries, I mix them directly into the batter. Coating them in the batter helps prevent them from bursting (and making a huge mess on my griddle). When I add chocolate chips, I scoop the batter onto the griddle and then immediately sprinkle the chocolate chips directly on top. Can this pancake recipe be used to make waffles? Yes! The ratios need to be changed up slightly, but this recipe can be used to make homemade waffles. Get my Fluffy Waffle Recipe here. Can this pancake recipe be made into mini pancakes or “silver dollar” pancakes? Yes! I have used this recipe to make miniature pancakes before. Mini pancakes are perfect for kids, a pancake breakfast bar, or to serve at brunch. Get tips on how much batter to use and more in this post: Strawberry Banana Pancake Skewers. Can this pancake recipe be made with buttermilk? Yes! Just sub out the whole milk for buttermilk. You can really use whatever milk you have on hand (skim, 2%). I have not tried it with milk alternatives, like cashew or almond, but these should be okay also. In fact, I use buttermilk (or a “cheater” lemon/milk mixture) in these Blueberry Buttermilk Pancakes. Can this pancake batter be made ahead of time? No. Most baking powder sold today is double acting, which means that the first leavening occurs when the baking powder gets wet. (The second leavening occurs when the baking powder is heated.) You may notice that after you mix the dry ingredients with the wet, the batter may “puff up” some in the bowl. The longer is sets without being heated up, the more it will lose that initial rise. I get comments all the time about the amount of baking powder in this recipe. This recipe calls for 3 1/2 teaspoons of baking powder. Teaspoons NOT tablespoons. Baking powder NOT baking soda. No, using that much baking powder will not make the pancakes taste weird or metallic. I promise you I make this recipe weekly. It has been rigorously tested and duplicated by many. This recipe is solid. That said, apparently some people are sensitive to the taste of some baking powders. (Much like how some people think cilantro tastes like soap and others love it.) If you are sensitive to baking powder, I would recommend buying an aluminum-free baking powder. Learn more about the differences between baking powder and baking soda here, like how to test if your baking powder is still good. Baking powder should really be replaced every three months for best results. Feel free to add a teaspoon of vanilla extract when you add the wet ingredients to the dry. Can I use this recipe with whole wheat flour? I tried looking for someone who already asked but you have so many positive comments it would have taken a week! Why do all these food blogs have a whole life story about how life changing every recipe is? Gotta scroll down for 5 days to find the actual recipe. But it’s a good one. Not the best. Just okay. Well, it took me less than 4 seconds to scroll down to the recipe (jus sayin’) which was wonderful. And the very definition of a blog as per Merriam Webster is the “online personal reflections, comments, and often hyperlinks, videos, and photographs provided by the writer” so why be surpised that there are personal insights? I love to find recipes via PInterest and read the blogs because I want that personal story or special tips and tricks the blogger shares. Otherwise, I would just go to the ton of cookbooks that I have. People like to explain things so it’s easier to understand and to add a little bit of the whys and hows their recipes came to be. Also if you bothered reading the “whole life story”, you will find gems of information sprinkled throughout. Perhaps scrolling will benefit you so you don’t feel the need to leave rude remarks/comments like this. That being said, I appreciate your recipe and the pancakes taste awesome! This will be my go-to when I make pancakes! Holy WOW these are amazing! So fluffy and perfectly seasoned. My husband literally asked, “Are these real? ?” Thank you for this recipe!! Also, I added the vanilla and it was game changing. Haha, that’s awesome! Glad you all enjoyed!! Yes!! I tried this recipe and this is THE BEST ever!! I’m not kidding. I have tried every recipe under the sun but this one is THE one. The only thing I do differently is add a touch of almond extract and a bit of apple cidar or white vinegar to the milk and they come out so perfectly fluffy and tasty! My daughter used to hate my pancakes. Now she cant stop begging for them!! Oh my goodness, my family devoured these! There is nothing left, I only got one. I was reading reviews and I think that baking soda was used by those that didn’t like them, I was a bit skeptical about the amount of baking powder but it worked perfectly. I did add vanilla. These are SO much better than the box mixes. My family really enjoyed them. Thank you for sharing your recipe! This is the best pancake recipe EVER ! ! ! I make this recipe all the time at my house and I’m only 12 so you can tell how easy it is.The pancakes are so fluffy and flavorful and sometimes, for fun, I add chocolate chips in it. These are by far the best pancakes ever ! ! ! I have been searching for the perfect pancake recipe…and I found it here! I’m very serious…it’s the perfect texture and even when I do substitutions it works well. I’ve added chocolate chips, coconut, you name it. I have it saved as a favorite in my browser and I almost know it by heart now. My husband is no longer the best pancake maker in the house and that makes me so happy LOL! So happy to hear that Alicia, your comment made my day! So simple. the measurements are spot-on for perfection. My boys told me these are the best pancakes they ever tasted! Thank you for sharing this recipe. My son is a picky eater and I needed a recipe that can mask his medication. This recipe was a hit for him. As soon as he took his first bite, he was hook. He had the biggest smile on his little face and he couldn’t stop eating it. I would have rated this a 5 stars but I had a little problem with my pan being a little too hot so my first 2 attempts of cooking the pancake was burnt. I had to adjust my temperature to a medium-low temperature for it to cook perfectly.Other than that, I will be making this recipe again. This is a really delicious pancake recipe! I have tried so many different pancake reciepies over the years and this one hands down is the BEST. 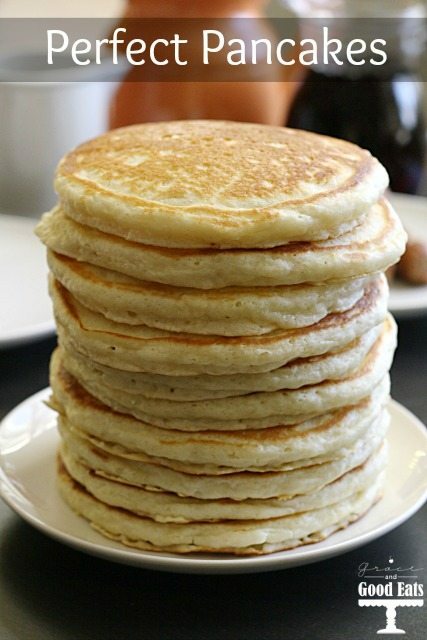 Fluffy flavorful pancakes and so easy to make. These pancakes taste it amazing! However I’ve been trying to find ways of adding extra protein into my diet. I found that if I added two extra eggs the pancake consistency didn’t vary that much but I did get the increase protein. One other thing. I noticed that this pancake recipe didn’t have vanilla in it. It tastes great without it but if you happen to like vanilla just add a teaspoon of vanilla to the batter. I just happened happened to be obsessed with vanilla. But the pancakes tasted great! these pancakes came out perfect! never had any pancake recipe work better! I have made this recipe a bunch of times now, with several different brands of gluten free 1-for-1 flour. It has been great every time! We usually add chocolate chips, and use just a few drops of syrup. SO GOOD! I am permanently converted from boxed mixes.. My daughter and I even used metal cookie cutters, to make butterfly pancakes today! We are in love with these. Thanks for posting!!! Did not like the taste of these. I made them for my kids and right away they said the pancakes tasted strange. I didn’t believe them so I tried for myself and yuck. Strange salty metallic taste. Wanted to love but won’t be making these again. This sounds like your baking powder may be old. Nothing in the recipe should be causing that taste. Try to find aluminum free baking powder. Did you use baking soda instead of baking powder on accident? I’ve never heard of baking powder to cause a metallic taste. Best pancake recipe ever! 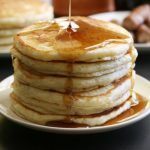 I’ve always made pancakes from boxed mix, but we were out so I found this recipe and these turned out better than any other pancakes I have ever made! They are thick and fluffy, better even than restaurant pancakes! I have been making pancakes for nearly 50 years and these were the VERY. BEST. I ever ate! Love that the measurements are so easy and love that you shared ! I have tried making pancakes from the box so many times but it seemed like pancakes were the one thing I just could not master. Just tried this recipe and they were a breeze to make and tasted fabulous! Thank you so much for sharing. This will be my go to recipe from now on! MY WIFE AND GRANDSONS LOVED THESE PANCAKES! IT WAS MY FIRST TRY…I FOLLOWED THE RECIPE AND FOUND IT TO BE FAIL SAFE. THIS WILL BE THE ONLY RECIPE I USE FROM NOW ON. These are the BEST ever. I’ve made so many varieties over the years and these are amazing. They were quick and easy to make. So happy to hear that you enjoyed them! Wow! I have always used box mixes for pancakes, but I came across your recipe and decided to give it a try. What a HUGE difference! Your recipe makes light and fluffy pancakes that are miles better than the belly bombs you get with the mixes. Thank you, thank you, thank you–my family are happy converts to these pancakes! Your comment made my day, Erin. So glad you and your family enjoyed them! Have you tried making waffles with this recipe? Wow! You’re right, these are the best! My husband said, “Wow honey these pancakes are really good! These are how pancakes are supposed to be made!” I’ll never buy boxed mix again, that’s for sure! They’re even delicious without syrup. I bookmarked this + took screens as a back up since I am unable to print. Definitely recommending to family & friends! So happy to hear this, Andi!! Emily, before I begin my rant and rave, thank you for having taken the kinks out of making great “from scratch” pancakes. For those people that wrote this recipe was not great, time consuming, salty, too much baking powder and soda, which does not even have baking soda, thats unfortunate for you all. Great “anything” takes time to make, salt is the basis of flavor in cooking, and well baking is perfection, following a recipe to make tasty greatness. I don’t think it was salty, it was perfect amount of baking powder, which allowed for the most fluffy pancake. From this point on this will be my go-to pancake recipe. I made these for my daughters, well one of them had 7 of them. I substituted the milk, for almond milk and did not change the flavor or density of the pancake, as I know it to be. I also added fresh blueberries to the batter, it gave it the freshness and tartness to counter the already perfectly sweet batter. And without further adieu, thank you for sharing such a great recipe. So happy to hear that, Juan! And, thank you for letting us know that you had success with substituting almond milk!! I followed this recipe exactly, but I used almond milk to avoid tummy issues. These are EXCEPTIONAL!!!!! Better than most restaurants, honestly. So glad to hear that, Lauren! Thanks for letting us know these worked well with almond milk! Thank you for sharing! I tried this recipe and it was easy. Pancakes were delicious and so fluffy. I dont use sugar so I substituted with Stevia and they were perfect. My only issue was getting them off the scoop or pouring it onto the pan because the batter is so thick, any suggestions? I haven’t made pancakes in over 15 years. This was very easy to follow and my pancakes were fluffy and amazing. Thank you. These pancakes are amazing! They have just the right amount of sugar to make them great to even eat without syrup. I added fresh blueberries and a light drizzle of some real maple syrup and they were the best pancakes I’ve had in a while. I did have to add quite a bit more flour to my batch to get my batter the right consistency (it was quite liquidy at first) but I wrote that up to a really humid environment. I loved these! My husband isn’t the biggest fan of pancakes but found these and decided to try them at 9pm at night, on a Monday. I guess we are random like that. My husband loved them and said they were perfect, which is amazing in itself. I’m not as picky but really loved these. My kids ate them too and enjoyed them. I am a chocoholic and was craving chocolate so I made some with cocoa powder and chocolate chips and it made a rather decadent chocolate pancake. Really good! So happy to hear that! We love adding chocolate chips- I’ll have to try cocoa powder next time! When I see “best ever” I’m always leery BUT this truly is one of the best ever pancake recipes! So easy and delicious! We have been snowed in all weekend and we have made them two mornings in a row. Thank you for this fabulous recipe!! I didn’t waste my time even reading any negative comments. This recipe is going into my permanent record…LOL. They are fantastic and extremely quick to make and truly light and fluffy. I ate them with only butter for a savory quick dinner. Next time I will add some blueberries to them! Thank you so much for sharing. WOW!! I have been making home made pancakes for 12 years now and am NEVER satisfied with them. I am not a breakfast eater but I have 5 kids and a hubby that are. So for special occasions I make pancakes. I found this recipe and read the entire article which I never do. I melted the butter in a saucepan since I don’t have a microwave and with the left over butter juice I boiled 1 cup of water, added 1 cup of sugar and 1 cup of our orange blossom honey, a tsp of maple flavor and a tsp of vanilla to make a home made syrup. The syrup was very yummy and runny but was amazing on these pancakes. I actually ate 2 myself. I honestly can’t tell you the last time I enjoyed eating breakfast!! Thank you for this recipe that is truly best ever!! The texture of these were so good I couldn’t believe it. I think my husband ate about 7 of them!!!! This made my day! Thank you for sharing. That syrup sounds delicious!! I’v been making this recipe for a few years now, it is the best. I tend to double the recipe and then freeze the left over pancakes. They are just as good frozen. They “plump” right back up! Great for a quick breakfast during school days, and I know exactly what is in them! Thanks for the great recipe!! Made Christmas pancakes this morning with this recipe. So delicious! I used up the last of my coconut sugar for it. I’ll definitely be making these again! I made these today with 1% milk..They came out yummy.I was nervous at first but was VERY happy..Does while milk make them taste better or something? Hi T, the whole milk has a higher fat content. I think it tastes better and yields a more tender/moist product when baking. 1% will work fine though, glad you enjoyed them! 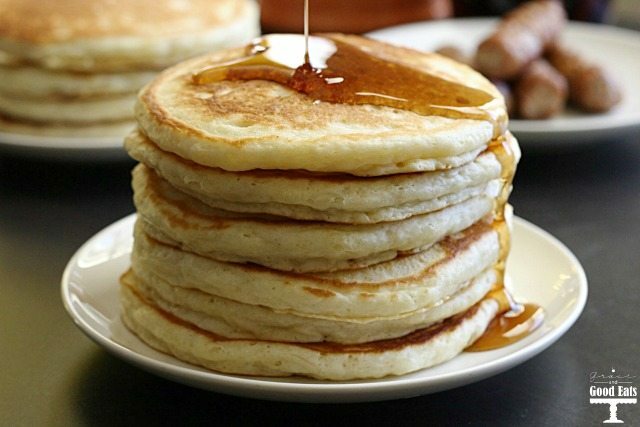 Great recipe for thick & fluffy American style pancakes – thank you Emily! Your lively commentary was just what I needed to choose this one to try over others. And no whipping egg whites – didn’t have time to whip today so looked for a quick recipe I could slap on the griddle – and these came out just like in the photo – so easy to make & delicious. Other than organic AP flour and brown sugar I followed the recipe to a T. Topped with some homemade candied oranges & syrup- a French twist. My son loved them with traditional – butter and Maple syrup. Quantity allowed me to freeze extras for another day. Really is the best and easiest pancake recipe!! I followed the recipe exactly and they were delicious. This is probably the best pancake recipe I’ve found. My wife has celiacs so we do majority of our baked goods gluten free. I sub regular flour with Bob’s Red Mill 1-to-1 baking flour and they are perfect. My wife has a hard time with baked goods because she remembers how good things tasted before she got diagnosed. I’m glad I found a pancake recipe that tastes like they’re not GF. Thank you. This made my day, Matt. So happy to hear that you and your wife enjoyed them! Made these for our post-Thanksgiving breakfast crowd…what a hit! The baking powder is very key to making the thick, bubbly batter that cooks up into fluffy, yummy pancake awesomeness!!! Happy Thanksgiving !! Ran out of regular milk, so we used some coconut milk with 2%. HA. Perfect and yummy pancakes. Added a splash of cinnamon. Used with homemade cranberry syrup. Kids are happy! Thank you! Oooh, homemade cranberry syrup sounds delicious!! I’m guilty of googling “the best ever…” for every recipe I’m looking for. These really are the best. Even my husband, who eschews carbs, loves them. I’m wondering how the cooked pancakes would freeze so I could save the rest for quick weekday breakfasts. I just made these pancakes. They were the best, just as stated. I changed it slightly. Used 3 teaspoons accidentally. Not sure how I missed the half on your recipe. But they were still great. I also added a small amount of milk, a drop of oil ( I always do when using butter in pancakes) and a teaspoon of vanilla. I don’t use syrup so these were perfect. I also drop frozen blueberries on my pancakes. I buy them in season and freeze them for muffins and pancakes. They don’t burst either when frozen. Not sure what others are doing wrong but this will now be my forever go to recipe. I didn’t have my cookbooks and was looking online for an easy one. Yours seemed similar and they turned out fluffier and lighter. My son and grandson LOVED them too. ( They use syrup). I will be testing more of your recipes. as you were right, these are the best!! I cant believe some of the negative comments. 1st of all they are just mean spirited. Secondly these pancakes are absolutely delicious. Very light and fluffy and they taste amazing. I have a family of 5 that agrees that this is the recipe we will make from now on. I will say I thought I did something wrong because the batter was so thick but they came out great. Thanks for the fantastic recipe! So happy to hear you and your family enjoyed them! Add a splash of milk to thin it slightly. I just made these and they were perfec I like a thinner batter so added a splash of milk and I also add a drop of oil when using butter in pancakes. Try them again. I promise they are perfection. Sprinkle some blueberries on top as the first side us cooking up. I add a teaspoon of vanilla too bc I dont use syrup. I’ve been trying to do more recipes from scratch and staying away from pre-made or box versions of anything. Pancakes were one of them. My husband loves pancakes. This recipe gained me roses (I’m blushing right now). Thank you so much for this. I want to also try this recipe when making a Filipino desert babinka. I usually use the boxed Bisquick… but this recipe might actual make it more flavorful. This recipe is the best! If your looking for a great pancake recipe this is it. Look no further. I made it exactly as printed. I suggest your milk and egg should be at room temp for best results. My son and husband rate it a 10! I added a few blueberries to mine and it sent it over the top. Thanks for the recipe! So glad you and your family enjoyed it, Carrie! My oldest loves when I add blueberries (and my youngest loves chocolate chips)! This recipe was great considering so few ingredients and of which none included baking soda. Baking soda tends to leave a bleachy to taste with pancakes. I did alter the recipe slightly and they were indeed the best pancakes I’ve ever made. I added about a tablespoon of vanilla extract and substituted the 1.5 cups whole milk with 3/4 cup whipping cream you can buy in a carton and 3/4 unsweetened vanilla almond milk (at the time I was just using what I had since I didn’t have milk let alone whole milk but it turned out great lol). You’ll probably still need a little extra almond milk because the batter is ultra thick and unpourable at these proportions. I want to guess I added maybe 1/8 cup extra but I’m not sure. I also used 4 tablespoons butter instead of 3 tablespoons. When I mixed in the butter with the milk it solidified into a nasty chunky mess which I think helped to add little bursts of flavor. Obviously not the healthiest alternatives so this isn’t an every day or even every Sunday recipe alteration but I’d say it’s worth it for a little indulgence once in a while. Hi there!! Just found your recipe and just had a quick question. Will be making mini-pancakes in November for a bridal shower brunch and was wondering if you had a measurement you would recommend for making them the perfect mini size. I am a person who likes making really big pancakes so making them the right kind of small is a little difficult for me haha!! True to the name- by far the best pancakes EVER!!! We ran out of pancake mix and I found this recipe.. I’ll never go back to the box! My 3 year old and I made these together. She added rainbow sprinkles to hers and I added a little pumpkin spice. Love! So good! I love the taste of these but can never get the consistency right. If I use the amount of baking powder the recipe calls for my batter ends up being way to thick, but it I try to use less baking powder they end up too runny. Any ideas? Hi Lydia, the batter should be thick. It should “scoop” not “pour”. Hope this helps. You want the batter to be thick, and lumpy. Try making your next batch just as directed in a recipe. If it is thick and lumpy – GOOD!!! ALSO: griddles are the best choice for making pancakes (they originated as GRIDDLE CAKES; however, since most people do not own griddles, they were dubbed, PANCAKES.) Your first pancake is going to be your test product, so drop only a small amount of batter onto an oiled surface of choice. Let the pancake cook; lift edge to see how the bottom is browning. Do not turn until holes form throughout. If you feel that the bottom is going to burn, turn down the heat. I like my batter a little thinner. I added extra milk, about a 1/4 cup. I also added a teaspoon of vanilla and a half teaspoon of oil because I don’t use syrup and added blueberries. I added the blueberries right on top the way the poster does with chocolate chips. I have used the Betty crocker recipe for years and this one was similar so I decided to try it instead of searching for the other one. Anyway, they were perfect. A bit fluffier than my other recipe. I also somehow saw 3 teaspoons of baking powder and NOT see the half one. So I actually used the wrong amount but still they were perfect. If you want them thinner just add a small amount if milk NOT remember you need to mix it completely while trying to not over mix your batter. So fold it in slowly and stop once it’s all combined. Over mixing will completely change your batter. And listen to this site. She says mix the milk and eggs together then add. DO THAT step . It’s important as the eggs get air and help with mixing the batter without you over mixing it. I would give this recipe five stars bit cant seem to locate the rate button. ( I swear I am not illiterate, lol) This will be your go to from now on, I promise. Dont listen to the negative comments. They obviously did something wrong and want to blame the recipe. Found your recipe this morning and made them for Sunday breakfast. After trying a number of recipes over the years this is the best ever! My family was delighted with them so thanks for makin me look good. Thank you for sharing. Greetings from New Zealand. So happy to hear you and your family enjoyed them, Rona! Made these for the first time this morning and to my disappointment, not that great tasting. This receipt calls for to much baking powder in my opinion. I looked over all the other comments to see what I did wrong and I’m not seeing my error. Betty Crocker Buttermilk pancakes are 10 times better tasting then these. Don’t waste your ingredients on these. You must have done something wrong then or you taste things differently, because without changing anything my family loves this recipe. Just because you don’t like something doesn’t mean you should slander it so other people don’t even try it. Let people make up their own minds. These were so easy and delicious!! My husband and 4 kids gobbled then up fast. Thank you so much for the perfect go to weekend pancake recipe! These are my go to pancakes when I run out of ready made batter. They are so delicious and easy to make! To change it up sometimes, I add vanilla and mashed bananas for banana pancakes. This is the first time I’ve ever made pancakes from scratch. They were fluffy and delish! Thanks for the recipe. Can you make this with almond flour? Or oat flour Or arrowroot flour and still be same consistency? With dairy free milk like Lactaid or almond milk? Or Soy? I’ve never tried any of those variations. Please let me know if you have any success! Love these pancakes. I add some vanilla extract and a little extra milk and they are wonderful. My husband loves them too especially when I add some blue berries. I’ve been on the hunt for an easy, throw together but still good pancake recipe. And this was SO delicious! My boys are very picky when it comes to pancakes and these passed the test with flying colors. Writing it down for my recipe box of ‘keepers’. Thank you so much! Found this recipe for a hint from my workout coach. These really are the best pancakes ever. I’ve made them 3x now and shared the recipe with others. My first two attempts weren’t as beautiful as yours, but the taste belied their excellent flavor. I bought an electric fry pan, and that has made all the difference. Wonderful, wonderful. These are super good! Not gonna lie tho the batter looked strange to me at first. Well, it didn’t matter because they turned out heavenly! I added banana. So super yummy that I shared this recipe on my own blog Facebook page so my mom friends can all try it too! Thank you for perfecting pancakes! My husband loves to add cinnamon to his as well! I too found that adding about 1/2 tsp vanilla boosted the flavor. Thanks – No more box mix for me! Amazing pancakes. I’ve been eating pancakes for 60 years and have never tasted anything like this. Totally magical. So happy to hear you enjoyed them, Lynn! This review is from someone who actually made these. I have to join the nay-sayers — followed the recipe to a T and really hated the results. “Hate” because I was promised the “Best.” I think that boastful claims have to be backed up! This recipe is far form the best ever. It has many flaws, not the least of which is 3-1/2 tsps of baking powder. A recipe that needs that much help is lacking in another place. They were really less than mundane and a waste of time, ingredients, and hope. Hi Mary. I stand by this recipe along with the other 300K people who have shared it and the 370+ people who have also “actually made these” and kindly taken the time to give it a collective 4+ star rating. Good luck finding the hope again to continue your quest looking for the “Best Ever” Pancakes recipe. The Baking powder and soda is way too much. There is no baking soda in this recipe. All the baking powder does is add height to your pancakes. It does not alter the taste of the pancakes. Soda? There is no baking soda in this. Perhaps you read another recipe? Great recipe, we loved them. After I made half of the pancakes I added 2 Tbsp of cocoa powder and a splash of hazelnut creamer to the 2nd half. My kids went nuts over those chocolate ones. I’ve been making these pancakes for my family for a couple of years after finding this recipe. It’s my go to. I usually use a little less flour and add some oats and they are still delicious. I love how fluffy they are! I unfortunately was disappointed. A busy mom finding time to make this recipe is frustrating. I have now realized my family and i aren’t use to Incredibly sweet pancakes. If you do not like sweet pancakes with syrup on top of it to make it even sweeter do not makes these. Hey Kim, confused by your comment because I’m also a busy mom (of 3, soon to be 4) and make these 1-2x a week. That’s part of the beauty of this recipe: extremely simple ingredients, that most always have on hand. If you need to save more time, you could always pre-measure the dry ingredients into individual bags or containers to have at the ready. Or make a big batch and freeze them. Also, if you already know your family’s preferences, you can always omit the added sugar… like many others have commented doing. Hope this helps. I have a very picky grandson, when it comes to food. I have tried several other recipes and this is the one he has liked the best. So glad to hear that, Judy! Everything about this recipe is perfect and the pancakes are delicious! The wrist trick to flip, game changer!!! Thank you! My family absolutely loves these pancakes! We make them often. Random question…we are headed on vacation and I don’t to have to bring all the ingredients and measuring spoons/cups, etc. I was wondering. Have you ever mixed all the dry ingredients ahead of time and then just add the wet ingredients before you cook the pancakes? These pancakes are great for my grandkids. They love them. Not sure what recipe I made for their Dad. But since these are a hit I make a double batch and freeze. One of them would eat pancakes for breakfast & dinner if I would let her. This is my go to base recipe for pancakes & waffles! I sub out white sugar for brown, regular milk for buttermilk & add an extra tbs of butter per recipe. My family gobbles it down, if I’m lucky I get to store a few away for breakfast another day! Best pancakes ever! Plus they are so easy! We had them for dinner tonight and my husband was hooked on them! I added a little cinnamon and a splash of vanilla. Can’t wait to make these again! Best pancakes ever!! Can’t wait to see what other recipes you have!! I love these pancakes! They are so easy to make and much better than store bought. I usually add raspberries on top while cooking. Can the recipe be doubled with the same results? You gave up a gem with this pancake recipe! In the hands of even a novice chef this recipe is the only pancake recipe needed. Absolutely better than following instructions on the back of a bag or box, going to a pancake restaurant, they’re just that delicious. Now am I able to use this recipe for waffles as well? Hi Ed, here is my waffle recipe: https://www.graceandgoodeats.com/fluffy-waffle-recipe/ it uses all the same ingredients just in slightly different ratios. Hope this helps!! I have never read the actual blog of any recipe before! Lol yours was the first one for me, I think I just might start reading them all now ☺️ Thanks for the recipe I’ll be sure to post how it goes. That’s so sweet of you to say, Sonya! Hope you enjoyed them! I sure did, I forgot to comment after I made them. Here I am again searching for this recipe. We loved them! Yep ! These have become our go to pancakes ! Thanks! Delicious. I’ve made as is and they were tasty. This time I added a little cinnamon, subbed 1/2 cup whole wheat flour, and added a ripe banana. My son nearly swallowed them whole. Enjoyed! Definitely tastier than my previous recipe. Thanks for sharing. 1. Is there a difference between using baking powder only or using baking powder with baking soda? 2. I immediately thought the 3 1/2 tsp of baking powder was much, but precisely followed the recipe. is there a reason why a copious amount of baking powder is used? this is a great recipe. I think the person who’s pancakes tasted like flour most likely forgot the salt. I always do one and taste test and add stuff accordingly…. I used whole wheat grain flour and buckwheat so I added a pinch more salt and some water. they came out perfect. thanks for sharing your recipe. Forgot my rating after my comment! Sorry! We love these pancakes with maple syrup! Sometimes we add chocolate chips or fruit and it’s a fun Sunday morning treat. Question – can this batter be made ahead of time, or saved? Hi Mallory, I haven’t had much luck making it ahead of time because after the baking powder is added to the wet ingredients and activated it really needs to be used quickly or it looses it’s power. You could always mix up the dry ingredients separate and have them already measured though. Thank you! That’s totally ok. On a similar note, any tips to freezing or storing any leftover pancakes after they’re made? I freeze pancakes by laying them out on a cookie sheet after I cook them. Let cool and then put in the freezer for an hour until they are set. Then put in a freezer safe Ziploc bag with a label. Just zap in the microwave for a quick breakfast. Indeed, best pancake recipe EVER. Thank you very much, my dad loved them and I can’t wait for my boyfriend to taste them also. I’ve served them with some homemade chantilly and fresh fruits and of course, some maple sirup. Just made these pancakes and they were AMAZING !!! I will never use store bought pancake mix ever again.. They were so light and fluffy the taste and texture were spot on My whole family is HOOKED !! Can’t wait to try your other recipes .. These are delicious! We added some milk chocolate chips and white chocolate chips.. so good! My kids (3 and 1) devoured them. Will definitely be keeping this recipe for our new go to pancake recipe! Just made these and they came out really good!! They were unbelievably thick ad fluffy. I used half and half instead of milk, and added vanilla extract and cinnamon. Topped with almond butter. Amazing! I usually make a mixture of cakes, either bananas, strawberries, blueberries, and even chocolate chips. I just drop them on top of the griddle and cover with batter. They took forever to cook, and when I couldn’t cook them anymore, they were still raw inside. Hi Sarena, sounds like you didn’t have your heat up high enough… which is a problem with following directions, not with my recipe. Try turning up the heat next time. Hope this helps! This is a great base recipe, but I had to tweak it to work with the ingredients I had on hand, really wanted pancakes so I decided to still give it a try. first off I doubled the recipe, and changes I made were, 4 tbls butter instead of 6, used 2 tbl baking powder and 1/2 tsp baking soda, didn’t have milk so I used heavy cream that I thinned out with water, which I ended up using a 1/4 cup extra of because the mixture was to thick….I also sifted my flour only because straight out of the bag it was lumpy, and added 1/2 tsp cinnamon….. and again I only made changes because I had to use what I had, and with that being said…this is my go to recipe from now on, the pancakes tasted better than a box mix and I’m sure the original recipe would be just as good. These pancakes are amazing! I ended up adding an extra tbsp of butter, a little vanilla, and only 1 cup of milk. Pouring the wet ingredients into the dry made for a thick, clumpy batter with beautifully distributed flavors that turned out the perfect thickness and was air light – I’ll never make pancakes another way again! This was easy and delicious! Thank you so much for sharing it! I was feeling lazy so just dumped all the ingredients into an old well-washed catsup bottle (with a funnel) and shook it well. I only had 2% milk. I cut the baking powder and sugar down a bit. They turned out great! Very thick batter, and even with less baking powder they still fluffed up like crazy. I’ll be making these again. Yummy! Just made these for my hubby for breakfast. I’m not a big pancake fan and I had two and I’m looking forward to trying the leftovers. Super thick batter, but they turn out very fluffy and they have flavor, unlike the boxed mixes. I don’t have whole milk on hand so used 1 cup 2% and 1/4 cup half and half and mini chocolate chips mmmmmmm. They cook faster in a pan on the stove top than on an electric griddle since you can’t set an exact temperature. This is our favorite pancake recipe! These have become a staple in our home 😊 Thank you for the recipe!! These are indeed wonderful! I’ve tried it with both butter and Pam on the griddle and prefer butter. I also use cake flour occasionally, and they are delicious and light. They are now a staple in my house, thank you SO much for the recipe! The batter should be very thick, doesn’t need any “doctoring”. Hope this helps. I’ve been using this recipe for a few years and the pancakes come out perfect every time. I love that I usually have the ingredients lying around, and can whip up a fluffy stack of pancakes whenever I want. I have a milk allergy, so the only adjustments to the recipe I make is using soy milk and Earth Balance vegan butter. My husband and I love to have these for breakfast with a pot of coffee on the weekend. This really is the best ever pancake recipe, and I will never look for another one! I thought they tasted good and so did my mom and my brothers and sisters. see im 13 and my mom has back problems so I have to do most of the cooking. Oh and I forgot to mention that im the oldest so I do have to do most of the cooking. and my dad took off so its hard on me and my mom but this time instead of just me cooking I did like a little project on it and we all made our own things and they turned out good so thank you so much!!! I’ve been looking for a quick, easy, fluffy pancake recipe and this is it! Thank you! AMAZING!! This recipe brought me back to my childhood. Do you have to beat the egg whites ? Beat the whole egg slightly. I crack it straight into the milk and mix in there before adding with the butter to the dry ingredients. Hope this helps. Just wanted to say thank you! I randomly felt like eating pancakes for dinner tonight so it was the first time I ever made them. Your recipe was easy to follow and the result was great! Only thing is.. I definitely burnt the first one because I was waiting 3-6 min per side like you instructed but each side actually only took about a min! These pancakes had perfect texture and taste. They were exactly as described and I was able to make them with ingredients on hand. Would definitely recommend and will use this recipe again :). I tried this recipe this past weekend and added 1/2 tsp of cinnamon and it tasted amazing! My 3 boys devoured them. Thank you for such a delicious recipe. These pancakes were amazing. They cooked very well using a cast iron skillet. Light, fluffy and full of flavor. I added cinnamon. Great recipe! Thanks! Been looking for the most perfect pluffy pancake recipe (even tried those Japan-style but failed) and here it is. Sweetness just right and so pluffy! My kids love it! WOW. These are AMAZING pancakes! Every member of my picky family loves them. They said throw out your other recipes. FLUFFY. SWEET. Great texture. I have tried variations also -a dash of vanilla and cinnamon, using all whole wheat flour, a tablespoon of wheat bran. Any creative additions are gracefully accepted into this delicious recipe. We made them with dairy free milk, too! These are now a go to for company and kid sleepovers. Thank you for this recipe. It’s THE BEST. So happy to hear that, Nico! These pancakes tasted good, but they had a weird texture because the mix was just so clumpy. I couldn’t seem to mix the clumps out. Even my 6 yr old noticed something weird about the pancakes. I made this recipe for the first time about 2 months ago and now we make them every weekend! My son absolutely loves them! Best recipe we have tried. These were the absolute WORST pancakes I’ve ever tried in my life. Not a single person in my family would eat them. They tasted too much of flour. Waste of perfectly good ingredients and time. Sorry to hear that, Bri, I’ve never had that comment from any of the other hundreds of people who have made this recipe with great success. Quality ingredients really make a difference, maybe try a different flour next time. Good luck. Just wanted to say that I made these pancakes for the first time a month ago and have made it twice so far. They turned out really lovely and I thought they were one of the best pancake recipes I’ve tried. I’m not a stranger to cooking and try lots of online recipes. Was surprised at the negative comment. Not sure what happened but I and many others have tried it with great flavor & great success. Thank you for your comment, Melinda! Glad you are enjoying them. I have to agree. This recipe has far too much baking powder. I’m a very experienced cook and baker and there’s just something wrong with this recipe. My ingredients are very fresh and high quality, so that’s not the issue. Martha Stewart’s recipe makes a much nicer pancake. This recipe is a definite 2 thumbs down. Glad to hear you found a recipe that works for you, Kelly! I love how fluffy and thick these were. I thought at first there was too much baking soda but the reviews tell me its probably me! I’m gonna make them again with a better quality of baking soda. I do however sub the milk with unsweetened almond milk, it seem to cook the same as the dairy version. 👍I love the simplicity of ingredients it makes it easy to whip up pancakes in a hurry! Baking powder, not baking soda. I’ve looked through all the negative comments and almost all of them make reference to either baking soda, or too much baking powder. I believe they are using baking soda instead of baking powder, too. Tasteless and the texture is off. My teeth felt gritty after eating these for some reason. Made these for the second time this morning…didn’t have any milk so substituted almond milk and they turned out just as good! Yay! The first time I made these I thought I’d done something wrong because the batter just doesn’t look like any pancake batter I’ve ever made. I decided to resist the temptation to thin the batter out, and I’m so glad I did! They really are the best EVER!! Will be making these for years to come! I am not a fan of pancakes & I never leave comments. 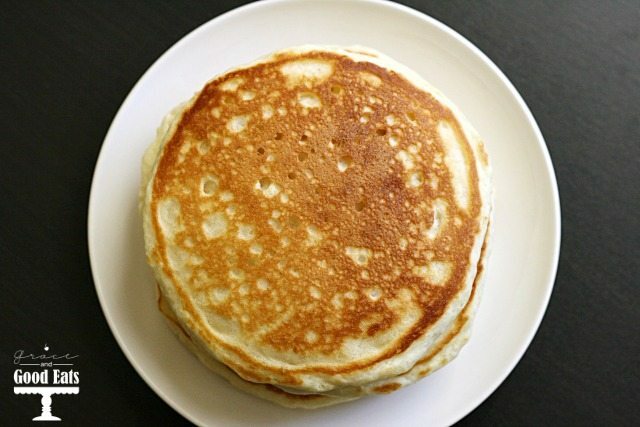 My husband wanted pancakes, googled best ever pancake recipe, this came up, he made them, I ate one, now we’ve had them several times because I keep asking, “Can you make those pancakes again?” You converted me. I’m hooked. These are literally the best ever pancakes! I haven’t made pancakes in a while and decided to do so today and came upon this recipe. I didn’t even read the directions I just needed the measurements to make the batter because I already have a way of making them. I had everything on the list except that I didn’t have table salt I used sea salt since that was what I had and it was a little more coarse so I was a bit concerned how it might affect the pancakes. I used unsweetened butter. I usually add vanilla extract to my pancakes but I forgot this time. I added some cinnamon and spice because thats what I like and usually put in my pancakes. I mixed the dry ingredients in 1 bowl. Mixed the eggs and milk in one. Leave melted butter separate. Then I mixed the dry and wet ingredients, stir a bit then add the butter and finish stirring until its well mixed but not overmix them. The batter was pretty thick, thicker than I usually like but I decided to just go with it. I usually cook on medium high heat like a 7 and it kinda turned out burnt so I lowered the heat to a 6 and sometimes 5 1/2 and they cooked fine. I was really amazed at how much the pancake batter rose and how fluffy they are. Usually in recipes I see they call for a tsp of baking powder per cup of flour. My 4 and 6 year old kids ate them without syrup with no complaints. I didnt get to try them without syrup but with syrup I really liked the pancakes they were amazingly fluffy and tasted great even without vanilla extract and with coarser salt it didnt change the taste. I would definitely make these again and save this recipe for more pancakes to come. I love how they are so fluffy! I actually meant that I added cinnamon and nutmeg. Lol. I made your pancakes tonight and my husband even raved about them! They are SO good and I loved that they use ingredients that I had in my cupboard! Thank you! Thanks so much for the time and effort you invested to hone this recipe. One expects pancakes to be pretty generic but not so in this case. Your pancakes are exceptional. We are officially replacing the recipe my wife has relied upon for over 30 years. If I had a B&B, these beautiful cakes would be front and center on the menu! Thanks for bringing some ‘WOW’ factor to a simple breakfast staple. Saturday mornings are looking up from here on out! Herb, your comment made my day! So glad that you and your wife enjoyed them. I’m not a fan of this recipe. It had no taste ( and I even added vanilla), burns easily and is REALLY doughy. It tastes more like a biscuit than a pancake so if you like biscuits…..then it might work for you. That’s weird. I just made these for the first time this morning, as written, and mine came out great. Not biscuit-like at all. The batter looked a little thick in the bowl but cooked up normal. I have made these pancakes twice they turn out amazing everytime my hubby loves them I did add some vanilla and nutmeg yummy !!! Reblogged on Random Thoughts, Purposeful Life. Thank you for the recipe! It was FABULOUS! The recipe didn’t say where the butter is used in the recipe so we topped our cooked pancakes with the melted butter. This recipe is outstanding! Thank you! Hi Cindy- in step five above you pour the butter and milk mixture into the flour mixture “well”. Hope this helps! Yes but before that it mentions nothing about mixing it in. There’s also a typo on the ingredients list next to the baking powder. Right, because until that step you do not mix it in. You mix up the milk and egg (step 3). Then you add the butter AND milk mixture (milk and egg) inside the well (step 5). Hope this helps. These are nice and fluffy but quite sweet. I will make it again but will definitely half the sugar. Thanks! Absolutely fantastic! This is exactly the kind of recipe I was looking for. It’s simple, delicious and melts in your mouth. I used 2% milk because it was all I had and added a splash of vanilla extract. There’s never any leftovers. Thanks for sharing! If I wanted to double the recipe, would I do anything different than just doubling the measurements? Nope! I just double the measurements. This recipe is absolutely amazing, both my family and I love it. It’s so quick and easy. Azrael…Just wanted to say…your name is beautiful! THE BEST PANCAKES EVER! We are making the switch to shopping as locally and cooking as naturally as we can, so I decided to ditch the boxed pancake mix and search for a recipe from scratch. I only buy 1% milk, but I had half & half, so I used 1 cup half & half and 1/4 cup 1% milk. FLUFFIEST PANCAKES EVER! I doubled the recipe, as I made it the first time, the second time around and it worked out just as well. Also, once I used half the batter, i added 1/4 cup chocolate chips and 1/4 cup peanut butter chips for my sweet toothed husband. DELICIOUS! This one has made it into the recipe book to bed used for years to come, for sure! The family loves it! Can I refrigerate the batter? If so, how long will it stay fresh? I wouldn’t. The baking powder will start to lose its power after it has been mixed with the wet ingredients. You could always make the pancakes and then refrigerate or freeze them after. Hope this helps. Last week, I made a large batch of batter, put it in the fridge and made fresh pancakes each morning for 4 days in a row without any problems. They tasted great each time. Good to know! Thank you for sharing, Ella. I pin, I post, I peruse, I poach. . . I never post comments. But I CANNOT believe this recipe. I kept shaking my head as they rose. I took them off the griddle and kept staring at them. I froze them, reheated them the next day, and ate them again in disbelief. Best pancakes I’ve ever made!! Fluffy and perfect!! This is my go-to recipe now! And the pancake flipping tip is totally life-changing! Hello. Do you think these pancakes would still come out really yummy if I used 1% milk? Thanks! I used 2%, and they were perfect! So glad you enjoyed them, Danielle! Agreed! I made them for dinner tonight and they were a hit. And just as easy as boxed mix! Hands down, this is the best pancake recipe I have ever tried. I followed the recipe to the letter and they were perfect. Thank you for sharing this wonderful recipe! Great recipe to make on a beautiful sunny morning up here in Vancouver BC. Our whole family enjoyed them and I will definitely be making them again. Thanks for the awesome pancakes! Just made these and they are perfect! Follow the exact directions and you can’t go wrong. Pancakes are fantastic! I added a dash of cinnamon and a splash of vanilla. So good. I will now have to try all of your recipes because you have gained my trust with this best ever pancake recipe…. But they were the best ever! Great recipe! It was a hit with kids. Funny enough, the dry ingredients are almost exactly what I use to make waffles (just a 1/2 tsp more baking powder). I noticed someone in the comments asking if this recipe would work for waffles- kinda. Start in the same manner with dry ingredients. Then, when you get to wet ingredients use: 2 eggs, 1/2 c milk, and 4 TBSP melted butter (or vegetable/canola oil). I also keep a little water close by in case I need to adjust the liquid content. I have also modified my recipe to include protein powder (which means I also add a little more water). They are yummy and filling. Truly the best pancake I have ever made or ever eaten. I don’t think it gets any better than this. Wow, wow!!! This is indeed the best pancake recipe ever. I certainly agree with the other reviewers. I just about followed it exactly but was running out of everything. I used part regular milk and cashew milk & part regular sugar and coconut sugar. It was still a winner. I will definitely make often. Syrup is optional with this recipe. The first one I made I ate straight off the plate. I’m wondering though if I can leave out the sugar and use as bread, since I’ve recently discovered a yeast allergy. I’ve tried this recipe twice now, and the taste is just fine, but they always turn out super runny 😕 not even close to “uniform”. I’m not overmixing either, it’s definitely still lumpy. Any ideas? Hmm… try to let the batter sit for 3-5 minutes to thicken up after you mix it all together. Hope this helps. Use a different type of flour. This happened to me when I was using White Lily flour. I switched to a different flour and they work perfectly now. I just sifted some more flour into the mixture until desired thickness. I just sifted more flour into mine until desired thickness. The recipe is great! This is my go to pancake recipe. I’ve followed it to a T, and I’ve added vanilla, either way is delicious. I have a sneaking suspicion that the people that don’t like them either have their griddle at the wrong temp, used baking soda instead of baking powder, used a different kind of salt, idk but everyone I’ve served these to agrees they’re amazing. Sometimes I’ll add a touch more sugar if I know my guest has a real sweet tooth. Hailing from high altitude! I used ~2tsp more milk, a splash of vanilla, and only 2tsp of baking powder and had a yield of 6 fluffy, tasty pancakes with about a 6″ diameter. Thanks for this. I am at 8,000 feet and the pancakes didn’t quite turn out. I will try these adjustments next time. Had to come on here and tell you that our search is over. These are the best pancakes we’ve ever had. We will never buy boxed mix again, or search for the perfect pancake recipe. This is it. Thank you! So glad you enjoyed them, Melissa! From another firefighter wife, this recipe rocks. My son couldn’t shovel it in fast enough. Great recipe and very easy! Thank you! This is the PERFECT fluffy pancake recipe ever! I am a pancake lover and i have never hit such sweet spot with any pancake recipe before… They turned out perfect in the first go, i just had to immediately thank you. So glad you enjoyed them, Dan! Hands down best pancake recipe! I add vanilla or almond extract. Picky and non picky eaters both love them, I now have to make them almost every weekend. So I have to leave this comment because I feel like everyone should know that this recipe is GREAT! My son is a PICKY eater but LOVES pancakes. I’ve used the all the boxed pancake mixes and he just doesn’t seem to like any of them. He says the pancakes are too dry etc. He likes them fluffy. So I told myself I would research fluffy pancake recipes and try them all until I found the one he liked. Luckily I found this one first!! 🙂 I followed the recipe to a T. When I say “ T” I don’t mean followed to a “T” BUT I doubled it or added vanilla, I REALLY followed the recipe. Anyways, I asked my son to taste the pancakes and he said they were GREAT! I asked my husband to try them and he said they tasted nice and fluffy (NO I didn’t tell him that was what I googled). All that to say never mind the negative reviews everyone has different taste buds. My families buds agree with this recipe! Thank you for blessing me and making this search so EASY! You made my day, Qiana! So happy your family enjoyed them! I used this recipe tonight for brinner (along with a few adjustments) and this turned out to be the best pancake recipe ever! First off I doubled the recipe and added about a 1/4 cup of corn starch into the flour before I measured it (making it cake flour) and I added 4 Tbs of white vinegar to the milk and let it stand for 5 mins (this makes it buttermilk) and I used vegetable oil instead of butter plus I added 1 Tbs of Vanilla extract. With my adjustments THIS Was the BEST PANCAKE RECIPE EVER! they turned out fluffy and perfectly moist. This is a keeper! I thought this is a perfect pancake recipe but it is not. Too much baking powder, it’s too way thick 🙁 I added 2 tablespoons of sugars. Anyway it’s okay. next time i’ll try! I tried this recipe today. I was very disappointed. They turned out very bitter. Too much baking powder from what I researched. My biggest mistake was making the whole batch without tasting how it was first. Had to throw out our breakfast which everyone was waiting for. Make sure you test your baking powder to be sure it is still good, sounds like it might be bad. Hope this helps. You didn’t do anything wrong. I just made them. I added about another cup of milk to make them runny enough. The kids liked them. Mine were like biscuits when I started and I just poured more milk in to get a pancake consistency. The batter should be thick, as stated in the post. It doesn’t “pour” which is why I suggest using a 1/4 cup measuring scoop to portion out the batter. This batter should not be runny. Hope this helps. These are fabulous! My new go-to. 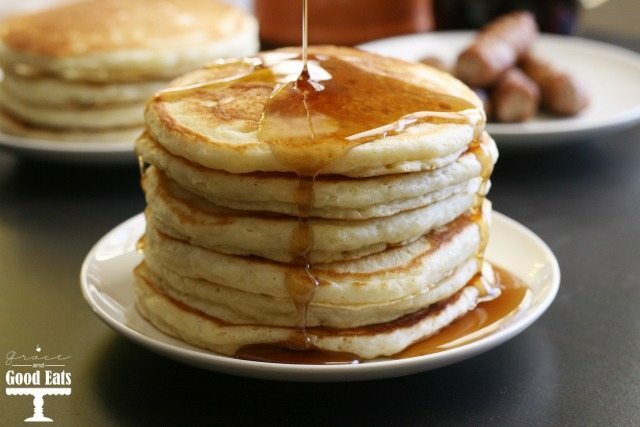 I’ve made them several times so far and they’re a big hit, they don’t even need syrup. They’re great with chocolate chips, too. Thank you! This recipe turned out great. It’s hard for me to find a decent home made pancake recipe. I substituted all the dairy with vegan ingredients such as plant based butter, almond milk and bobs red mill egg replacement,and some vanilla extract and added blueberries and they turned out nice and fluffy. Made these and followed the recipe to a T (I do a lot of baking so I’m used to that) and the batter came out so liquidy but I continued anyway. The pancakes came out flat and not fluffy at all 🙁 but the taste wasn’t bad. I’m always reluctant to make (and subsequently burn) pancakes. This recipe with all its instructions and tips did the trick! I doubled the recipe and added 1/2 teaspoon of vanilla extract. Had to add a little more milk to thin it out a bit. Since I used a cast iron pan, I sprayed Pam on for every pancake, and each flip, and on the spatula. I had the pan on a little high, so the first two pancakes ended up on my plate 🙂 best recipe ever! Definitely had a strange after taste to these and too salty. I think the baking powder was too much which was contributing to the off putting taste. Needs a little more sugar. I’ve never had this issue. You might want to make sure your baking powder is fresh. Hope this helps. I have tried so many different pancake recipes all of them being just ok. These are the best pancakes I have EVER had or made! I actually had to write down the recipe on a card to file away with my other favorites (I RARELY do that)! Now I will be looking for more good new on this site! Thank you for such a wonderful start to our lazy Sunday! I notice certain baking powders have aluminum (did I spell that correct?). Amyway, this can give an off putting taste. Some people taste it more than others. David I will say i made this today and it was also very bitter and didn’t taste good at all…… I was super surprised because I saw nothing but pretty much awesome reviews for this recipe so I was like what gives? So I came back to look at the recipe once again just to make sure I didn’t miss anything….. and low and behold I DID!!….. I realized that I used baking soda… instead of baking POWDER……. There is a huge difference between the 2 leaveners and you def want to make sure you are using POWDER…. Doesn’t hurt to make sure you baking powder is fresh also as it typically lasts about 3 months -ish…. My go to pancake recipe! I’ve used this for a couple of years now. Every time we have guests my husband insists that I make these, and I always get rave reviews. I tend to add double the sugar.. I know, I’m terrible! I also add a dash of vanilla, but otherwise follow the directions. They always turn out perfectly! We’ve added everything to these from berries, bananas, even chocolate chips! These are excellent with homemade blueberry syrup, peanut butter.. anything your heart desires. Thanks for the wonderful recipe! So glad you enjoyed them! I love adding chocolate chips too! Please revise the amount of salt in this recipe. The pancakes come out salty. Only half the amount of salt is needed. The pancakes were fluffy, that’s a plus. I would like to retract my previous comment do the fact that I made a mistake. I use 1/2 tbsp instead of 1/2 tsp as the recipe indicates. I will try the recipe again and I’m certain the pancakes will come out perfect. Yes. The difference will be negligible. I followed the recipe of using a tsp and they are still salty. They look gorgeous but inedible unless drenched in syrup. I think it’s too much baking soda. Ah, I used baking soda instead of baking powder! Don’t recommend it. The pancakes had a werid anc awful aftertaste. I had to drown my pancakes with syrup just to make it edible. Hmm, I’m not sure why your pancakes tasted “werid”, Aries. I have never had that problem and I make these weekly. Be sure you are using fresh ingredients. Good luck. i had that one time. i had messed up and used baking soda instead of baking powder. now, my kids double check me before i make them 😜 these are sooo easy to make and are truly the best ever! My husband loves these pancakes. I added 1/2 teaspoon of white vinegar with the full cream milk. I wanted to move away from boxed pancakes so had been searching for a good homemade pancake recipe. I tried multiple recipes that I didn’t like. I wasn’t hopeful when I tried this one because of the others but I was pleasantly surprised, these were amazing!! My girls love them. I didn’t make any changes and they came out perfect, fluffy and delicious. Thank you!! Also, would this recipe as is make good waffles or would I need to adjust measurements? I made these delicious pancakes. I was out of regular sugar so I substituted the same amount of light brown sugar and added a couple handfuls of chocolate chips. The kids loved them!! They were fluffy and delicious but still had a little bit of crispness on the edges. I am definitely keeping this recipe! I love pancakes and ALWAYS mess them up. Going to get a griddle and try this recipe tonight…. but what if I wanted to add some pumpkin? How would that change the amount of flour or baking powder? Hi Edna, I’ve never tried that so I can’t give you too much advice. Adding pumpkin will definitely change the texture/ water content. You may even be able to swap the egg for pumpkin (like many people do with applesauce.) I’ve never tried this though. My kids and i loved them! Do you know if they freeze well? I was wondering if you add the butter at the same time as the milk and eggs?? I made the mistake of adding hot butter to the cold milk and eggs and it basically re hardened the butter 🤣 But it didn’t do anything to the recipe I now just add it in after the batter is mixed a little!! OK. I just threw out my old pancake recipe and substituted with this one. These pancakes are amazing! I made them this morning and hubby loved them too. I didn’t have any whole milk so I used half 2% milk and half buttermilk. I also added a splash of vanilla. They were delicious and very easy to make. The pancakes were completely inedible that amount of baking soda gabe them a disgusting flavour. Not a recipe to repeat. Omg! I’m in love. The best pancake recipe EVER!! 🙌🏻 Follow the exact recipe it’s soooooo perfect!! The recipe is amazing. I was a bit skeptic about amount of baking powder, but it made my pancakes fantastically fluffy and soft. I did exactly what recipe said and it pancakes were so good. Awesome, I’ve found the recipe I get to test out on my new set of pancake griddles!